Today, director Roland Emmerich is celebrating his Independence Day 2 sequel with some pretty big casting announcements. We've heard for a while that original ID4 star Bill Pullman will be returning to fight another day. While that has now been officially confirmed this morning, we also get the surprise revelation that fan-favorite icon Judd Hirsch is also going to return for this epic blockbuster! 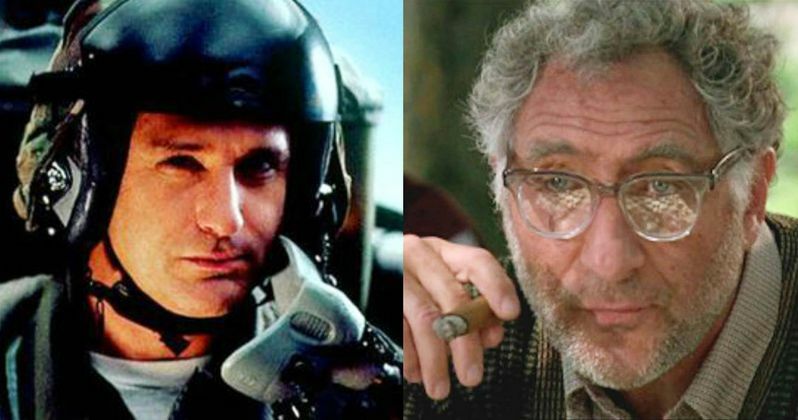 Judd Hirsch will officially reprise his role as Julius Levinson, the cantankerous father of Jeff Goldblum's David Levinson. Goldblum was confirmed for the sequel after much speculation earlier this year. Bill Pullman, who has also long been suspected to return, will once again don his three-piece apocalyptic presidential wear to play former POTUS Thomas J. Whitmore! Both actors join a cast that also includes newcomers Liam Hemsworth, Jessie Usher, Charlotte Gainsbourg, Travis Tope and Joey King. Vivica A. Fox and Brent Spiner are also set to reprise their roles from the original. At this point, it looks like the only main cast member not returning is Will Smith, who seems to be missing out on a good time. Independence Day 2 will arrive just in time for the July 4th holiday when it opens on June 24th next year, with a story set 20 years after the first aliens attacked the world! Who's excited?